This follows our accreditation to the Electric Vehicle Homecharge Scheme, meaning that any installation we carry out, either on a business or domestic property, could be eligible for a grant to cover part of the cost, as accredited installers Elec Cert Ltd are able to claim the grant on your behalf. Launched this month, the WCS has been introduced to encourage businesses to install charge point installations and increase their electric vehicle fleet with a £300 grant scheme incentive. 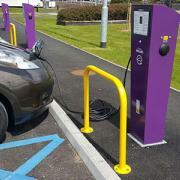 To be eligible for the scheme, a business must have a need for electric vehicle charging equipment, maintain it for a minimum of three years and have dedicated off-street parking for their staff. Up to £300 against the cost of each installation can be claimed up to a maximum of 20 sockets across all sites. Administered by The Office for Low Emissions (OLEV), the scheme is open to registered businesses, charities and public sector organisations in England, Wales, Scotland and Northern Ireland. Businesses apply to the scheme though OLEV and once approved, a voucher is issued. Installations need to be carried out by an accredited installer to redeem the voucher. £7.5 million has been made available to the WCS as part of a major £35 million package to boost the uptake of ultra-emission vehicles. With the number of registered ultra-low vehicles increasing by 250% in the last two years, the funding will see thousands more electric vehicle charge points installed both in the workplace and on the streets. For more information on eligibility please visit www.gov.uk/government/collections/government-grants-for-low-emission-vehicles . Please click on Workplace Charge Points Information Sheet in the drop down menu for a list of the types of charge points available.